Owns Woodbury Park golf course. 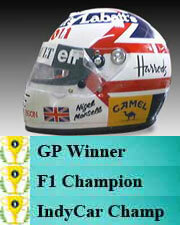 Nigel was the last Ferrari Formula One driver selected personally by Enzo Ferrari before the great man's death in 1988. Nigel won world championships in both Formula One (1992) and CART (1993). He is the only person in history to hold both titles simultaneously, and was the first person to win the CART/ChampCar title in his debut season. In 2010 Nigel linked up with British sportscar team Beechdean Motorsport and formed Beechdean Mansell Motorsport to run a factory-backed Ginetta-Zytek Z09R in the LMP1 class of the Le Mans Series with his sons Leo and Greg Mansell. They retired from LeMans after a heavy crasch where Nigel brook his leg. In oct 2010 the team closed its doors and put the car up for sale.